Shhh! I have a secret addiction this time of year. Yes, caffeine laden drinks and mini candy bars, but something else too. I love peeking into the rooms of other music teachers! 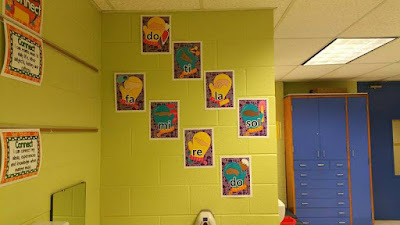 I've always been the only music teacher in my school so I can look at other classroom teachers' rooms but I never get to see what other music specialists' rooms look like. Fortunately others feel the same way and I've got to peek into some on Instagram and Facebook. In this post I'll introduce you to my new favorite decor theme-cooking! Be sure to read all the way through to the end to learn about a special opportunity to get FREE Bulletin Board Lady merchandise and to link up pictures of your classroom. The cooking theme was really something I've been wanting to do for a while. 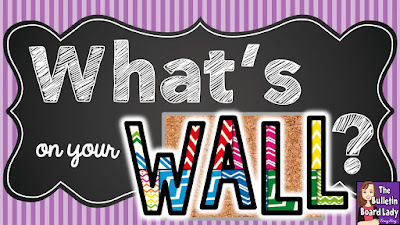 There are so many inexpensive ways to decorate your classroom that look clever and inviting. The bulletin board above uses a tablecloth for the background and 6-inch paper plates for the border. You can find it HERE. Teacher friend, Jeaneau Julian, also posted this board. I love her background color. It really pops! Here are a few more pictures from Jeaneau's classroom. I love how she has everything set up. 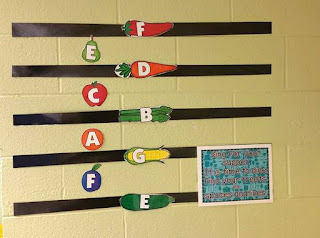 When displaying the Treble Clef Staff set she used laminated strips of bulletin board paper. So smart! 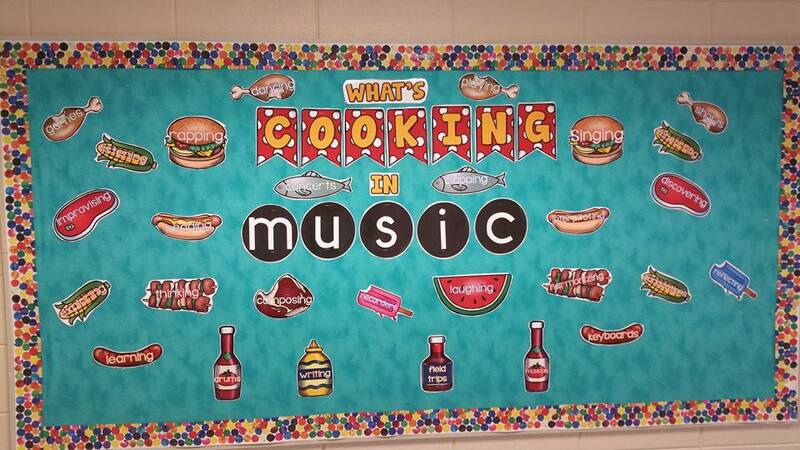 With the National Music Standards - Cooking Theme she grouped each of the "I Can" statements under their category. I love the way she utilized the cork strips to attach the posters. It is definitely a smart use of space! In this picture you can see (from left to right) the dynamics set, the tempo set and part of the music symbols set. This is such a colorful eye-catcher! I must admit I can never line my things up so neatly. It is why I give them that "collage" look. This picture show more of the music symbols set and on the filing cabinet you can see the Ensemble Posters. This set reminds me a little of Veggie Tales. Oooo! I should definitely find my Bob and Larry puppets! 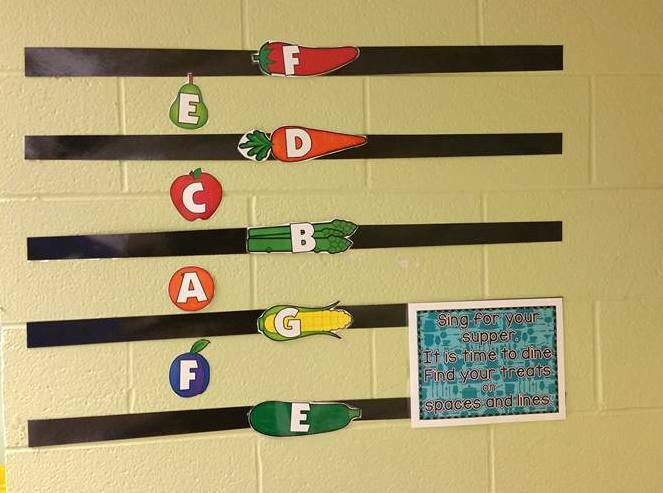 Outside of the music room she has displayed part of this bulletin board set. I bet she'll swap out some of the pieces as the school year goes on. In the spot at the bottom she will post her class schedule. I'm crossing my fingers that she does it like a menu! Thank you for sharing your classroom with us Jeaneau! It is beautiful! So, let's go overboard. What do you say? I love working with themes and want to share a few more cooking/food ideas with you to carry the theme even farther. First, you may want to check out these blogposts: Dip and Chips Workstations, Dip Tray Workstations (Instrument Families and Note Values, and Dip Tray Workstations Bottle Cap Pitches. 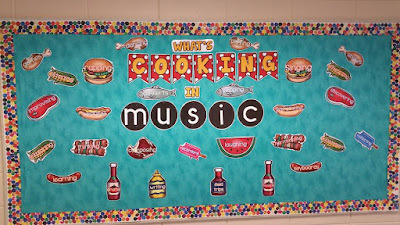 The novelty of these workstations keeps students engaged and they totally match the cooking theme! These hard, plastic plates were being clearanced at Wal-Mart. I got 4 for $ .88! Need to post daily/weekly I can statements? This was so easy. I attached a number doughnut (FREE download here) to the plate with tap and secured them to the wall. Command strips or hot glue would work well for this. 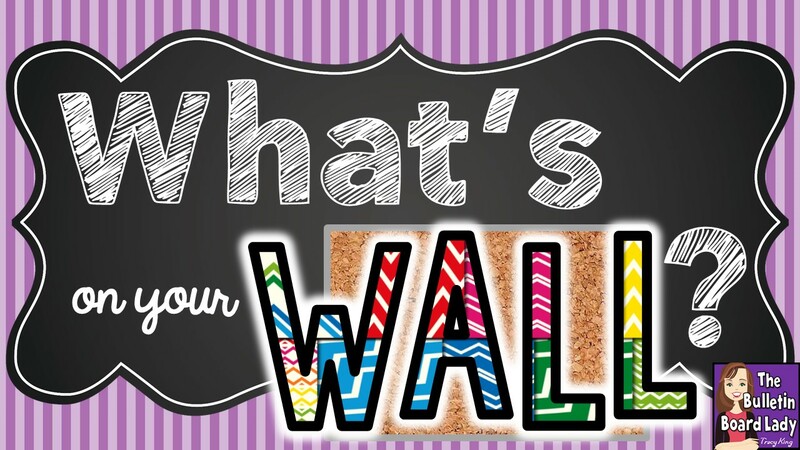 If you would prefer to take them off the wall to write on them use Velcro. 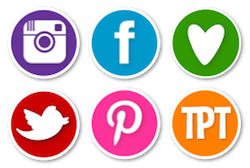 Post them so that they are easy to reach and write your "I Can" statements for the week. I see each class once a week so this is an easy way to display them all. Dry erase markers wipe off these plates easily. If you leave it on for a long time you might consider using some of that whiteboard spray on them and wiping them clean. Like most teachers I love my local dollar stores! These plastic, metallic-looking, platters work create with a dry erase marker. 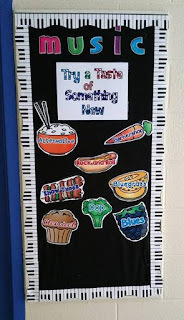 This would be great to put outside of your classroom door for notes or announcements. Oh! I also love yard sales! Look at my latest yard sale score - plastic lunch trays. I found a pretty big box of these for three dollars. I used the 3 compartment trays for the grade levels that have 2 classes and the 4 compartment trays for the grade levels that have 3 classes. My weekly schedule can be posted in a most unusual way. These trays allowed the marker to be wiped off, but not easily. When I'm finished with them I'll probably use fingernail polish remover or maybe spray paint them with chalkboard paint for use in a workstation. 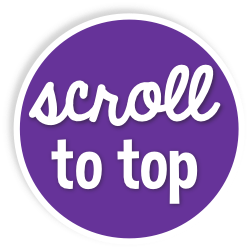 The grade level labels are available HERE for free. 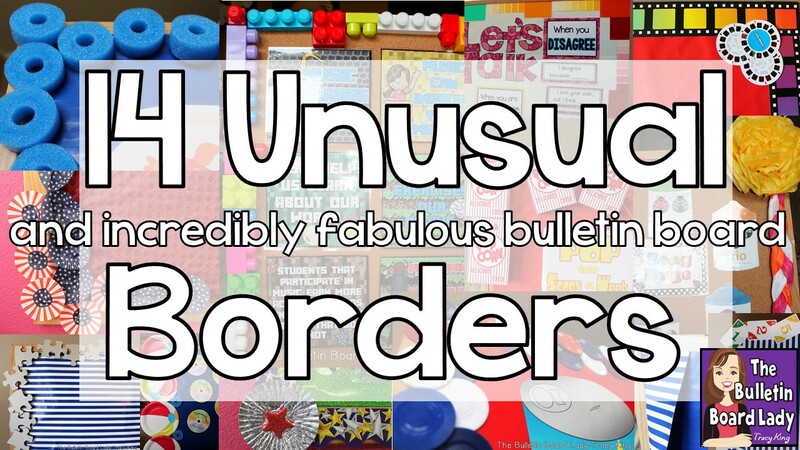 Attach them to your wall with Velcro, Command Strips or hot glue. This theme lends itself to repurposing all sorts of things from home. A peach box is now a basket for markers. If I get board with that I may paint it to look like a woven wicker basket. These cans that used to house veggies have been converted to pencil cans. The labels are a FREE download HERE. Plastic tumblers or coffee cups would work well too. The spoons are attached to some of the pencils with clear tape. I'm thinking that this may help me lose fewer pencils. Maybe. I spray painted the spoons. I wanted to do them in a variety of colors, but just had black on hand. Next I added a few dots with acrylic paint and let them dry. After they were dry I attached them to the pencil and they are ready to go. Students can't use the eraser this way, but I keep a box of erasers for just that purpose. I take a regular sized eraser and cut it into three pieces to make them last longer. 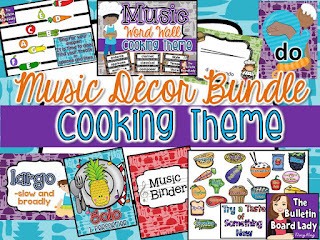 Most of the displays for this theme shown above can be found in the Music Classroom Decor Bundle here. 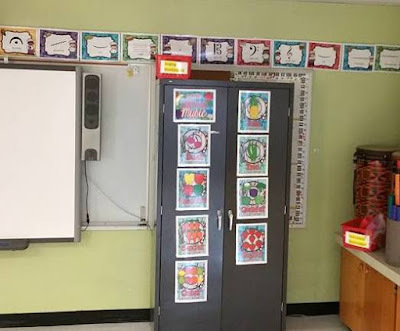 Check out these fabulous classrooms!